Welcome to my Guernsey SEO website experiment/case study . Thank you for taking time out to visit and check out what I am doing here. This experiment is also on another blog but it makes more sense to include it on this website where people can see it more easily. It’s an intriguing twist of fate that I am conducting and writing about a live experiment on the very website I am experimenting on. You are observing the dawn of my new business. As I conduct this experiment, I will be updating this page so if you are interested on following its progression, please bookmark this page, and feel free to share it. The point of this experiment is to prove to you and other website owners that I can get a website onto page 1 of Google where all of the searches are performed. With that in mind, I will not go into too much detail about how to choose and purchase a domain name, how to configure the domain and hosting or how to install a website onto my hosting account. That is not what this experiment is about. For over a decade now, I have been optimising websites, (SEO or Search Engine Optimisation). It started off as a necessity to get my own sites ranked in Google. Lately however, as a natural progression, I have decided to start my own SEO agency in order to help other website owners to get to the first page of Google. There are other search engines but Google is by far the biggest one as it attracts about two thirds or 67% of all search engine searches. 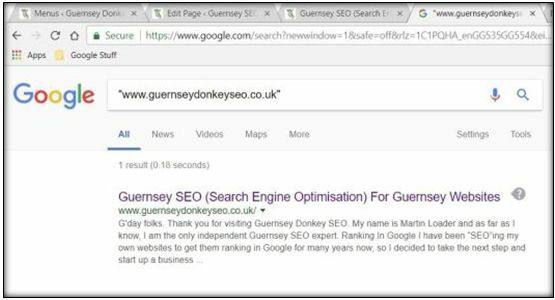 The aim of this experiment is to get the search phrase or keyword “Guernsey SEO” onto Google page 1 as high as possible, hopefully in position 1. I can’t put a time frame on this because Google is a weird and wonderful monster that has many idiosyncrasies and they are totally unpredictable. One of the issues with new websites is that Google “sandboxes” them. This is a filter that they put on new sites for several months that is designed to prevent spam. It is not so prevalent now but there used to be many churn and burn websites that were pure spam designed to fool Google’s algorithm. Another reason for time delays in a website moving up the SERPs (Search Engine Results Pages), is that any backlinks that are earned can take a month or two before Google crawls them and takes them into consideration. OK, let’s start the experiment. The very first thing to do is choose a domain name. 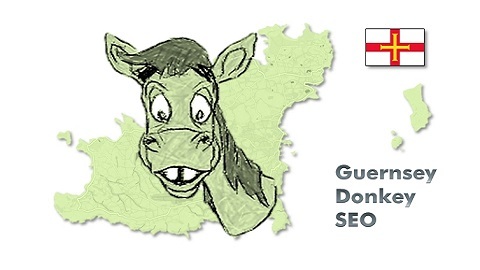 As you probably have guessed, this one is called guernseydonkeyseo.co.uk. I went ahead and purchased the domain from Godaddy as you can see in the below image. The next thing I did was to associate the domain name with a hosting account that I already had, again at Godaddy. There are a whole load of tutorials that are available online to show you this. Some of you won’t need to do this as you will already have a website up and running. Those of you that are still to get a website, your website designer will probably set this up for you anyhow. Once the domain and hosting are connected which took only a few minutes in this case, I downloaded a content management system (CMS) called WordPress. This is the world’s most popular CMS as a quarter of the world’s blogs are created on it. See image of new website. This is the default theme that gets downloaded. I don’t use this theme as it isn’t suitable for my needs. There are many hundreds of themes that you can choose from. Some of the more professional themes you have to pay a few dollars for but the free ones are perfectly adequate. I use them all of the time. If you see the image below, I have changed the theme and completed a few changes to it such as put a header on, added a menu and wrote my first article. Still not sure if I am happy with it and may change it again. I just wanted to show you that my new domain was brand new. As you see by the screenshot below, Google had not yet got around to indexing it in its SERPs. 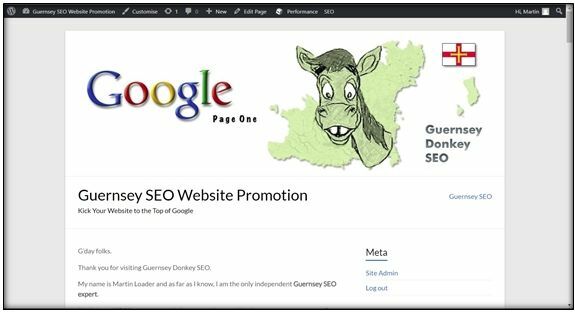 This proves that is a completely new site and that Guernsey Donkey SEO is a brand new agency. Right then. That was the website installation completed and the first page was populated by my first article. My next job was to make sure that Google indexed it so that it appears in the SERPs. As you can see in the image, that is done. All brand new websites will be crawled and indexed by Google in good time. Sometimes it could only take a day or sometimes it could take a couple of weeks or longer. Established websites seem to get new pages indexed almost immediately. There are ways to get a new website indexed very quickly and that is to link to it from your social media pages. 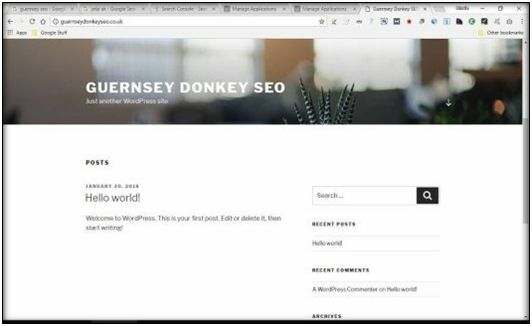 As I had already set up my Guernsey Donkey SEO brand social media accounts, I created links to my website from them and Bingo, it was indexed. One of Google’s biggest ranking factors is how many, and the quality of links that link to your site from other websites. There are so many different ways to obtain these links, called backlinks. This is a link – Please Click On Me. As you can see, when you click on the link you are directed to another destination, be it part of the same page, another page on the same site, or another site completely. Why get backlinks? Well, to Google, they are a measure of a website’s popularity, a vote of confidence in other words. Backlinks are all created differently. There are some bad ones and some good ones. Links that come from link farms, blog networks and many blog comments for example, are considered spam and are to avoid at all costs as they can get you de-indexed by Google or simply demoted in the search rankings. A good backlink is one that occurs naturally, or organically. This happens when the owner of another site thinks that your content, an article, video, infographic or podcast for instance, is so good that they link to it naturally. They do this because they think that their website visitors will benefit from it, which means that their website will be more popular. A naturally occurring backlink is great, but it is even greater when it comes from a website that is on the same topic as yours, even better if it is the same niche exactly, even better if that website itself has great site and page authority. Ideally all links would be like this, however they are hard to come by and have to be earned. Your site content MUST be AMAZING. For example, it has to keep people captivated, they must find it fascinating, and it needs to be informative. Bear this in mind when creating content for your website. Make it as best you can possibly do. Not poor, not average, not good, but great and more. I could go on and on about building backlinks for your website, there are so many ways and techniques. Some methods are simply ingenious you would never have come up with the idea. You have to do it in the correct way or else you will be penalised. Google has over 200 on-page and off-page ranking factors in their algorithm and if you break their guidelines, you can say adios to your website. Although you can recover from a penalty, it can take a long time and can be expensive to do. OK then, my website is up and running and it is indexed in Google. That is the on-page SEO taken care of, now for some off-page SEO. This is the actual start of my experiment which is to claim my place on the first page of Google for the keyword “Guernsey SEO”. I am going to begin getting some links to my website now. Please bookmark this page and come back to see how I am getting on. Whenever I see an improvement in ranking, I will post an image showing where I am in the search results. 10 days have passed since the last update. There have been no major movements or changes. As I wrote about earlier, Google sandboxes brand new sites to check them for quality and they are not spam. This is what has happened to my website but I am not concerned. I know that it will be released into the SERPs eventually because I am confident it is not spam and hopefully people will find it a quality site. 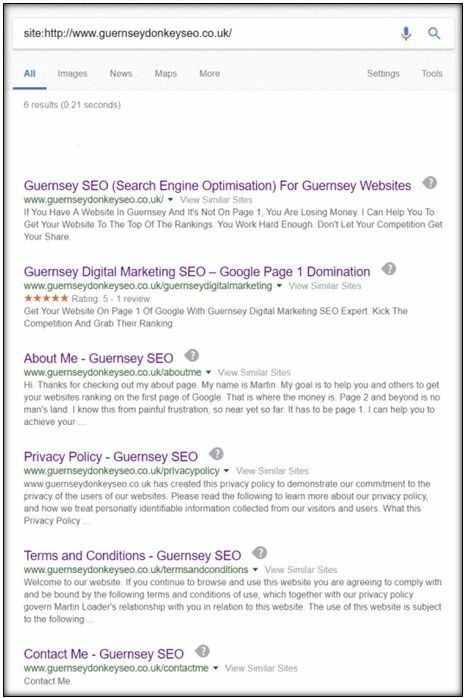 The curious thing is that a page did appear on the first page of Google for my targeted keyword “Guernsey SEO”, but it was the digital marketing page, not the page that is targeting that keyword, but it wasn’t there for long. This happens all the time with new sites and pages. Google likes to test things out, for their own reasons. Anyway, on to the link building. I have signed up for 5 different web 2.0 third party blogging platforms. 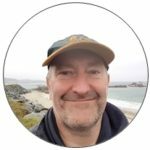 On these blogs I have created 3 or 4 unique pieces of content on them from articles to images to videos from YouTube. 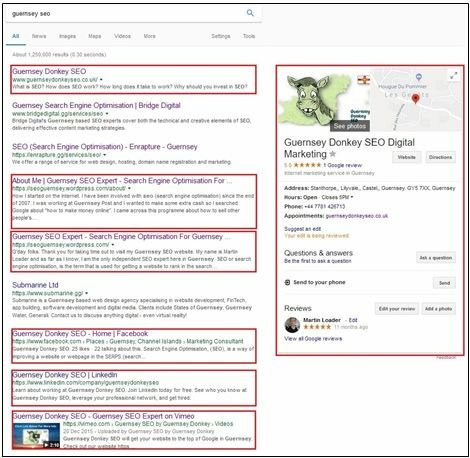 The content has to be unique because if it is duplicate content and has maybe been copied from another website, Google will not give that page any authority and will eventually de-index it. You are basically wasting your time. Once Google removes my site from their sandbox and then they index these other links to my site and pass on their site authority, I am anticipating it to get ranked on the first few pages. Additionally, as I wrote about previously, my social media brand pages are linking to my site. These backlinks however, are no-follow. What is no-follow? I hear you ask. I said earlier that there are good links and bad links. There are also links that have the “nofollow” attribute included in the link. These are neither good, nor bad. Well, they are good in that traffic does flow through them so you will get visitors to your site from other sites. However, they don’t pass any page or site authority from the originating site. This means that they won’t affect your rankings very much in the SERPs no matter how many of them that you have. No-follow tells the Google “crawlers” or “robots” or “spiders” not to crawl that particular link. My thinking is that they do actually crawl and follow the link but it’s just the authority of the page that isn’t passed on. The “nofollow” attribute was created to stop the rampant spamming that was taking place. People used to spam websites with rubbish to get a link back to their site. Over the last couple of weeks, I have been busy creating backlinks, not too quickly but consistently. 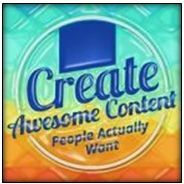 I have signed up for a few more web 2.0 properties and created more unique articles for the content. I have also added videos to those pages. I have also created 2 videos that I have been promoting on video sharing sites and social media. I have added unique articles to pdf and file sharing sites. I decided to move some pages around a bit. Previously my pages didn’t have the “html” element at the end of them. They went from http://www.guernseydonkeyseo.co.uk/guernseyseo to http://www.guernseydonkeyseo.co.uk/guernseyseo.html. This is only cosmetic really as I prefer URLs structured like this. I redirected the one to the other with a WordPress plugin in order not to lose any page authority. I changed the home page to a more generic article and put the old home page article onto another page. How is the experiment going? Well, see for yourself. Check out the image below. I am quite surprised as it has got there so quickly. Well, maybe I shouldn’t be. I have structured the site well and the “sandbox” hasn’t been too much of an issue. As you see, I am in position number 1 for my targeted keyword “Guernsey SEO“. I am not certain that it will stay there because the site is so new and the Google dance may kick in for a few months. Google likes to experiment with positions to give its users the best possible experience. I am certain that eventually, in the longer term, it will stay at the top. Well, that is the experiment concluded. I got my search phrase to position 1 on page 1. End of experiment but my website is FAR from completed. My next goal is to go after the keyword “Guernsey digital marketing” which at the moment is at position 33 in Google. This keyword will be a bit more difficult to achieve as there are more companies that are optimised for it. I will get there, I know I will. When I have done that I will go after more keywords that will bring in more and more business. It is an ongoing process. Go after some low hanging fruit first (long tail keywords), and then go after shorter tail keywords with more search volume. I went after the keyword “Guernsey SEO” with other web properties that has brought me solid leads previously, so I started a new website on Tuesday 30th January 2018 because I don’t like to rely on third party web properties long term. It took a couple of days to get my website indexed in Google. I optimised my home page around the targeted keyword and sent some links from social media to it. I then built links from other high authority web properties over the course of 2 or 3 weeks. I created unique content for those properties. After 3 weeks of my new website being indexed, I achieved my experimental goal of getting my target keyword to the first page of Google. Further to that, it got to the first position. 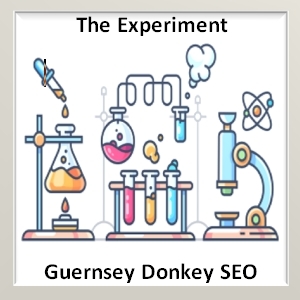 The Guernsey Donkey Experiment - "How To Get Your Website On Google 1st Page"
This entry was posted in Guernsey SEO. Bookmark the permalink.